This is an ultra-modern house with today’s trends explained with a strong sense of imagination and merrymaking and has been structured well with curves. This house is built in 60 cents of land with a built up of 15000 sq.ft. in two floors with 4 bedrooms. The glass wall exterior gives a different look. The small shape carved to the side is an attraction. 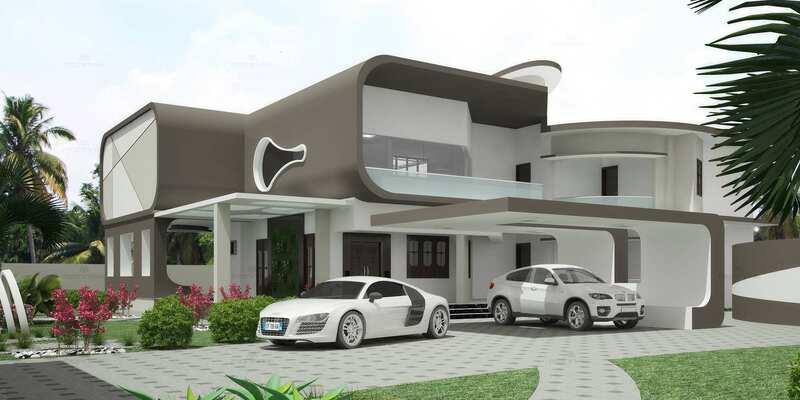 Open car porch and the exquisite serenity builts this contemporary and grandeur in Architecture designs. The Maple brown tint on the windows and doors glide with the white and grey exterior. The small patio on the terrace gives an ultimate view and a relaxing space/fun area for the full family.